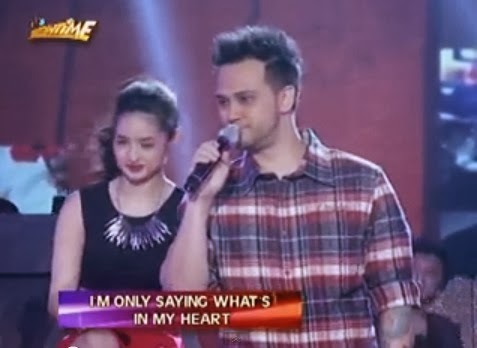 Host-singer Billy Crawford serenaded rumored girlfriend Coleen Garcia in the Valentine's Day episode of It's Showtime on Friday, February 14, 2014. Billy Crawford made a soulful performance of 112's Cupid which it seems the meaning of the song applies to the current status of their relationship. Crawford was joined by other It's Showtime hosts like Karylle, Vice Ganda and Anne Curtis in a special presentation for Heart's Day. "I'm happy that today we're celebrating the beauty of love. For some people, they wait for love. For some people, they search for love. I believe love is full of surprises", Coleen said before her performance. "Madlang people wag kayo magulo, nanliligaw lang ako. ", Billy said as Coleen ends her 'You Were There' performance. Billy then kissed Coleen in her hand as 'madlang people' and the Showtime hosts teased them. Vice Ganda keeps on teasing Billy and Coleen few days before the Valentine episode. Vice even tagged the tandem as 'Bi-Col', the newest love-team on national television. In 'Buzz ng Bayan', the showbiz oriented show of ABS-CBN, Billy admitted that he is courting Coleen. “Yes, nililigawan ko. She is not my girlfriend yet, and I would love for her to be.”, Billy said. Both Billy and Coleen were also spotted watching live for the PBA semis between San Mig Coffee Mixers and Ginebra on Monday, February 10 at Smart Araneta Coliseum. 'Billy and Coleen' was a hot trending topic on Twitter Philippines that night.